Twice a week, like clockwork, a new article or review is posted on The Clearance Bin, and twice a week, also displaying a manner not inaccurately compared to a clockwork mechanism, we in The Middle Room inform you, our reader, that such an event has occurred. Should we ever stop, we fear, the very fabric of our Universe might unravel, so integrated are these updates to the heartbeat of our reality. But fear not, for we have remembered our responsibilities. And so, with much fanfare, we announce that a review of the item pictured above has been added to The Clearance Bin. And what might that be? 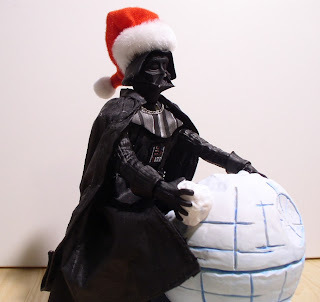 Why, it is a Star Wars Fabriche in the likeness of Darth Vader. Truly, it is a disturbing object; a rejection of redemption for the damned, symbolically represented by a visage of the Sith Lord, so far lost, that his dark repressed intentions are subconsciously revealed in a canvas of pure snow. 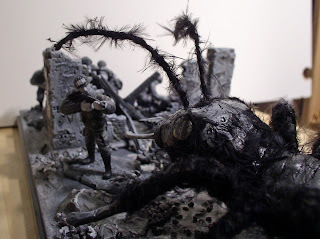 This is no mere sculpture, but rather poetry incarnate. For those of us who are fans of both superheroes and animation have much to celebrate. There are, at present, a larger number of high-quality animated series in production than any time we remember. It is, for the geek, somewhat bewildering: we did not realize what was happening until these shows were upon us, and when they were, it took us a moment to regain our thoughts. We were skeptical of most of what follows - cynical even - since all of the following, in some ways at least, struck us as unwelcome additions to the genre. But, in every case that follows, we were proven wrong. Let us begin, as it were, with the newest of the bunch: Wolverine and the X-Men. When we first saw trailers for this work, we were of two minds. On one hand, the show appeared quite dark - a positive in our minds. But, at the same time, there were warning signs. Wolverine is many things, but a leader is not his strong suit. 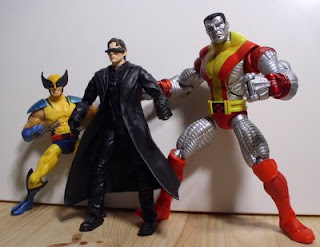 There is, however, an exception to this rule: in some apocalyptic future story, we've seen an older Logan leading the X-Men. We were shocked to find that not only are the writers clearly familiar with this, it seems to be the very impetus for the series. While no huge catastrophe has befallen the world, things have grown darker than we'd have expected from a program appearing on Nicktoons. This isn't to say the program is perfect: sadly, it is not. The animation, while exceptional at times, is uneven, and the writers have yet to prove their comprehension of some characters. In addition, no animated X-Men program has yet solved the problem of Wolverine not being allowed to kill on children's television... though this has done a better job than any other attempt we've seen. In just two episodes, they've incorporated elements of Grant Morrison's wild Sentinels and Mutant processing plants from Days of Future Past. At the same time, there is a sense that these stories are new. Throughout the history of the comics, there has always been the threat that things could fall apart. The show is based in that world. The telepaths of Earth, including the professor and Jean, have been attacked and are missing. The mutant registration act has passed. We are fascinated to see how the story develops. Two episodes have aired so far, and, for the time being, both are available free at Nicktoons' site. These are recommended viewing for any fans of Marvel Comics. It wouldn't do to bring up the subject of a post-apocalyptic Marvel Universe without at least acknowledging Marvel's recent direct-to-dvd movie, Next Avengers. The premise is surprisingly dark: an aging Tony Stark has raised the children of The Avengers in their parents' absence. And why are their parents absent? Because, dear reader, Ultron killed them. On the surface, Next Avengers is a simple legacy story of a team of young superheroes following in their parents' footsteps. But that was gleamed from previews, and it is far from the most interesting aspect of the film. We had assumed that The Avengers fell defeating Ultron, and we expected this to be the story of his return, when the children had to band together to fight him. But we were very, very wrong. Ultron did not go anywhere. He began a worldwide conquest, as nations and continents fell before him. By the time the movie begins, he rules most of the world. The surviving humans are nomadic warriors, waging a battle against armies of robots. Next Avengers tells an unusual story, one where the heroes have failed and a villain has won. In this regard, it is quite fascinating. It would be better, however, were it a little darker. We never actually see the horrors that are suggested, a problem, I suspect, caused by a desire for a PG rating. Had we seen more of the impact of Ultron's rule on humans, we believe, it would have delivered a more fulfilling emotional punch. There are other complaints we might make as well. 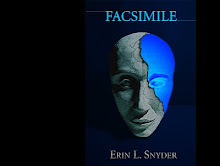 For instance, some of the dialogue was a bit weak, and the ending felt rushed (though we found ourselves happy with the direction that was taken). Marvel's earlier direct-to-dvd projects have left us disappointed. But Next Avengers was a pleasant surprise. If you've an opportunity to watch this, we happily recommend it. As much as the above impressed us, we are even more taken with Cartoon Network's work on Batman: Brave and the Bold. Long time readers of The Middle Room will no doubt recall our concern when the program was initially announced. 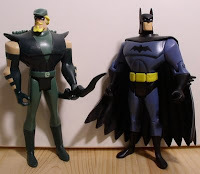 Fans of Justice League Unlimited may recall an episode where Batman and Superman casually discuss a problem they've been having with Captain Marvel, all the while fighting a gang of supervillains. It is as if this one scene were stretched into an entire series, and that series is Batman: Brave and the Bold. Never before has a DC animated series felt so embedded in a comic universe: not even JLU. This takes place in a world of established heroes and villains, some represent generations of crime fighters. We are unsure exactly how many episodes of Brave and the Bold have aired, though we know we have missed at least a few. We have had an opportunity to view four episodes, however. Of these, two were good, though far from spectacular. The more recent episodes, on the other hand, floored us. In our favorite episode, Deadman and Batman team up to battle Gentleman Ghost. In addition, Green Arrow and Speedy show up, as well, though they're in more of a supporting role. It was a surprisingly nuanced story, which includes an unexpected cameo by the spirits of Bruce's parents. In another episode, the new Blue Beetle approaches Batman for help tracing the legacy of the scarab. The story is interspersed with flashbacks of the final adventure shared by Batman and the previous Blue Beetle, Ted Kord. Both of these episodes dealt with the issue of death and were unafraid to address the subject head on. It is rare for animated programs to do so, even more so for a show that's ostensibly aimed at a young audience. In addition, we would like to address the issue regarding which Batman appears. While the artwork of Brave and the Bold evokes the Batman of the fifties, the character himself, we contend, bares more than a passing resemblance to the work of Denny O'Neil, debatably the most significant writer to take on The Dark Knight. He may be operating in a brighter world, and he may not be quite as frightening, but make no mistake: this is Batman. Cartoon Network seems to keep a few episodes up on their website at a time. If you hurry, you may be able to catch our two favorites before they are cycled out for something different. Do not think for a moment that we've finished. Here, in this very room, we have devoted numerous postings in an attempt to draw your attention to The Spectacular Spider-Man. Frankly, after all this time, we are somewhat exhausted. And yet, we hear whispering that there are those of you who have yet to experience this program. At present, it is on something of a hiatus. Reruns are still aired, though the time slot they've been placed in, 7:30 AM, if rumors are to be believed, is less than ideal. As far as we know, WB has not seen fit to offer this program online. Nevertheless, we suspect it can be found in other locations. Finally, we would like to draw your attention to a superhero program that's easy to overlook. For a few seasons now, PBS has aired the adventures of Word Girl, a superheroine with an exceptional vocabulary. Oh, she also has the normal assortment of super-strength, speed, and invulnerability. Word Girl, we understand, is intended for six year olds. The action is typically stopped so that words can be defined for supervillains with a below average IQ. And one more thing, dear reader: we love every minute. It's difficult to explain why Word Girl is as good as it is. But there's something infectious about the dry humor of the program. The jokes, while certainly appropriate for young children, are surprisingly clever, and the characters, while simple, are intriguing and likable. Many of the conceits are clearly derived from The Powerpuff Girls, including the narrator's constant interference with the story. In addition, there's a villain named Dr. Two-Brains, who has a second brain coming out of the side of his head. The second brain, it should be noted, is that of a mouse. His crimes are, logically, cheese related. 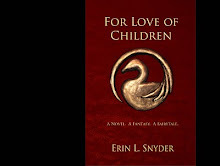 Any of our readers who have young children would certainly enjoy watching with them. Those without children are advised to tune in, as well, though we suspect most of you will ignore this recommendation. It is your loss. Some pictures speak for themselves. Clearly, this is not one of them. Therefore, a rather comprehensive review has been posted to The Clearance Bin. There are many things that can be said about the Underworld franchise, more than a few of which are negative. It can be said, for instance, that these are bad movies, that by any metric - be it acting or writing or directing - the series is sub par. A similar complaint could likewise be brought against the cinematography. Or editing. Costume design. Set design, wardrobe, effects - both practical and computer generated, production, and catering. And we've heard the key grip was mediocre at best. But such criticisms have no place here. They are, admittedly, valid and appropriate in the world outside, but we in The Middle Room judge movies like these by other criteria. And, in many ways, this was an exceptional film. The color correction alone was fascinating to watch: so much blue was added that the picture, at times, seemed as animated as Speed Racer. Of course, in the case of Speed Racer this was the intended effect, while in Underworld: Rise of the Lycans it seemed accidental... but that is the very point. Underworld: Rise of the Lycans is a dramatic failure, an unintentional comedy, and a glorious one at that. Is it the next Chronicles of Riddick? No, it is hard to imagine any film achieving the glory of Vin Diesel's (iD&Di: 1.0) classic. But it is a worthy attempt, nonetheless. It is difficult to describe the experience Rise of The Lycans offers its viewers. It is as if the makers of a SciFi movie of the week were given the time and money to attempt to recreate Lord of the Rings. The script is written as though penned by a sixteen year old, and each line that escaped Bill Nighy's lips is one of comedic brilliance. Yes, there is genius in this picture's simplicity. To state that cliches occupied the dialogue doesn't do the film justice: it was as if every line was a cliche. Indeed, we never realized how many cliches existed until we saw them delivered, one after another, in Rise of the Lycans. At all times we were engaged, and we were not alone. The audience was never silent: not for a moment did the laughter cease. It should be added that the film was intended to be dramatic. This did not detract from our enjoyment, but rather enhanced it. Anyone can make a bad movie without trying, but only but attempting to craft a good film can one fail and make something gloriously bad. And glorious Underworld is. It is pablum for the soul, and for, if nothing else, it was worth the cost of admission. That vampires and werewolves slaughter each other in bloodbaths of video game-quality CG doesn't hurt, either. If Chronicles or Riddick is a five star picture, Underworld: Rise of the Lycans deserves three. They may not be the brightest of stars, but they deserve something for effort. 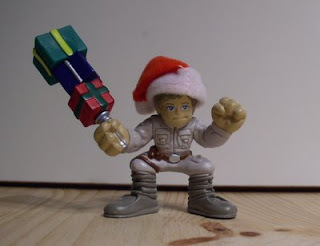 A rare two-part study of a toy is available to those of you with interest in the subject. The Middle Room has made available a review of two Forces of Valor playsets, which were subsequently dismantled, repainted, and in other ways changed for a custom project detailed in The Blue Fairy's Workshop. It has been an odd week for geeks and, by extension, for The Middle Room. It has been a week of changes and surprises, some good, some bad. No one, we think, has had a worse week than Batman. As we reported a few days ago, Bruce Wayne has gone the way of many masked heroes before him and died in the line of duty. Our grief is diminished, however, by our knowledge that there is life after death, or there is in comics, anyway: we certainly don't expect Batman to stay dead long. But death is merely the beginning of The Caped Crusader's problems. The Academy, it seems, has kicked him while he's down: they have withheld a "Best Picture" nomination for The Dark Knight. It was our sincere hope that The Dark Knight or Wall-E might receive such an honor, but neither recognized. We take some solace in the knowledge that Heath Ledger's (iD&Di: .45) final performance was at least acknowledged. He is in good company, it seems, as Robert Downey, Jr. (iD&Di: .42) was similarly nominated for Best Supporting Actor for his recursive role(s) in Tropic Thunder. Between the two, it's our belief the award should be given Ledger, whose portrayal of The Joker was truly inspired. This week was not merely a time for grief, but for celebration, as well. The ten year anniversary of The Powerpuff Girls was this week, and, to mark the occasion, the series was released as a single boxed set. 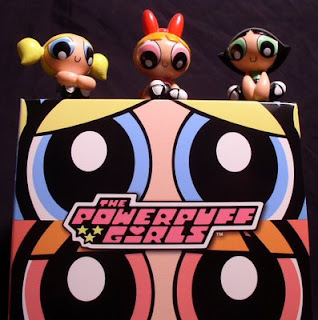 The Powerpuff Girls, of course, are among the most important superheroines created in the past twenty years. The series balances superheroics and mundane problems with stunning precision. Many of the best superhero creations of the past decade, from The Incredibles to Sky High, seem to have been inspired by Blossom, Bubbles, and Buttercup. Every episode of The Powerpuff Girls, including the original pilot, "The Whoopass Girls" and the ten-year anniversary episode, "The Powerpuff Girls Rule! ", are contained in this set, which is being offered on Amazon for $43. Note that this means you will pay approximately $7 per season, a bargain if we've ever seen one. We have recently received our copy in the mail, and are most impressed with how well it holds up. While we're on the subject of 10 year anniversaries, recent archival footage has surfaced celebrating ten years of Dr. Manhattan. We discovered this story on Ain't It Cool News, so it seems only fair we refer you there for details. We are certain that, by now, much has been written about the death of Batman. What's more, we suspect that most of those who've commented have, unlike us, had an opportunity to read the issue of Final Crisis where Bruce Wayne finally dies. Oh, that reminds us: SPOILER ALERT. Don't read the above paragraph if you want to avoid learning about the death of Batman. Don't get us wrong: we've heard the event was handled tastefully, that the issue in question was, in fact, quite good. But there is a sense of fatigue we feel when a superhero dies. It is no longer a question of whether the character will come back, mind you, or even a question of when: it is a question of what the company will do in the meantime. "The Death of Superman," once the comic event of the century, is remembered now for it's handling of the character's legacy, not the awkward death and resurrection of Kal-El. The death of Captain America is likewise being celebrated for its depiction of a post-Rogers world: there is little attempt being made to deny his eventual return from the grave. But it is hard to respond with anything less than cynicism to the news that Bruce Wayne, the most marketable property of DC, has (for the time being) stepped briefly into the great beyond. As we hinted a moment ago, Marvel has killed off Captain America to great effect: for DC to follow suit now feels derivative, to say the least. Whatever has occurred in the world of comics, dear reader, rest assured he lives on in our hearts, our dreams, and on our toy shelves. 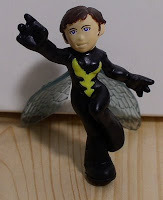 Yes, to mark this somber event, The Clearance Bin contains a review of the very same action figure pictured above. 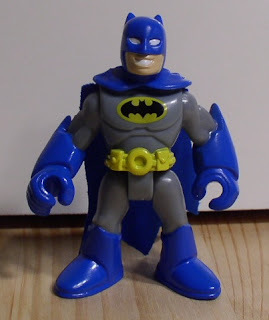 If you consider reviewing a child's toy callous and inappropriate in the face of such tragedy, we offer this by way of apology: we will surely try to find a more suitable action figure to commemorate the next time Batman dies. There are moments of profound importance that should be remembered for all time. Sometimes these are celebrated for all time, but, as often as not, they are forgotten by a world that neglects its past and its depth. We are here today, in The Middle Room, to celebrate an event that deserves grander fanfare than we can provide. By rights, this should be a holiday or, at the very least, there should be a parade. But we haven't the power to arrange these things. This humble tribute shall need to suffice. Twenty-nine years ago, to the day, the cast of Star Wars appeared on The Muppet Show. This would not be the only time Muppets and blasters shared the screen: Frank Oz (iD&Di: .36) puppeted Yoda (iD&Di: .61) in The Empire Strikes Back, which was released the same year. It troubles us that many geeks today have never seen this episode of The Muppet Show, where the destruction of Alderaan was revisited (unlike any later Star Wars movie) and where Luke Skywalker comandeered the Swine Trek to search for a captive Wookie. 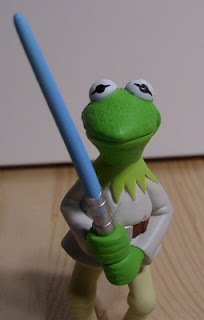 Fortunately, Disney has remembered this event, and, in its honor, has released a set of Muppet figurines dressed as Star Wars characters. Were The Clearance Bin to neglect such a release, it would represent a heinous crime. Fortunately, a review is now present, just in time for the twenty-ninth aniversity. What's more, while Jim Henson is no longer with us to celebrate, it is clear than his spirit is with us still. 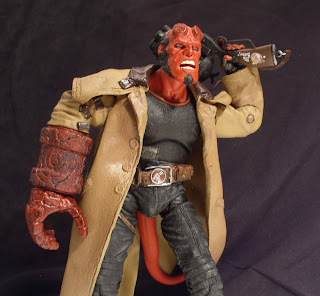 The Clearance Bin has been updated to include a review of a Hellboy action figure. The Middle Room's support of Speed Racer has been no subtler than the film itself. From the moment it appeared in theaters, we have sung its praises. But, until now, we have not had occasion to purchase its merchandise. This has now been rectified, and a review of the Mach 6 has been posted in The Clearance Bin. The Middle Room, we believe, is intrinsically progressive in nature. Our gaze is locked on the horizon, the future, and it is atypical for us to turn away and reflect on the past. Yet there are, on occasion, events which demand our pause. 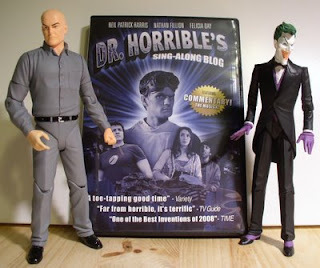 The DVD of Dr. Horrible's Sing-Along Blog is such an instance. Those of you who have visited The Middle Room before may recall our initial discussion of Joss Whedon's (iD&Di: .97) musical exploration of the psyche of a supervillain. Regardless whether you agree with our assessment, we challenge anyone to claim it failed to deliver on its promise of portraying a villain through song. It is another promise made around the same time that has brought us full circle. Rumors were circulated that when Dr. Horrible was sold on DVD, a musical commentary would be included. The cynical among us wondered if perhaps this was ruse, if the commentary would, in fact, be a commentary ABOUT the music, or even musicals in general. Or, perhaps there would be singing only in moderation. But no. Dr. Horrible contains a commentary track, gloriously produced, that is itself a musical. Not just any musical, mind you, but a musical about the making of Dr. Horrible, itself a musical, whose images play over the songs. Truly, this is a dizzying affair. But, if you are able to appreciate the musical nature, "Commentary! The Musical" is a brilliant musical exploration of the psyche of a cast of actors musically exploring the psyche of a supervillain. The Middle Room is impressed. Those with an interest in toys may want to stop by The Clearance Bin. 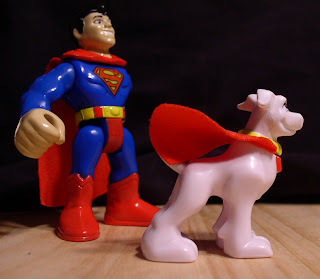 A review has been posted analyzing an Imaginext: Superfriends Superman and his dog. There is no controversy regarding what is wrong with Steven Spielberg's film, Artificial Intelligence: AI. If the title feels redundant, rest assured it is appropriate: every other scene in the movie feels as though you're re-watching the one before. There are very few films we truly consider "too long," but here the label certainly applies. The final twenty minutes are the very definition of superfluous. It is impossible to watch the end of the film without a sense of confusion and bewilderment settling in. We have never, in all our discussions of this movie, heard anyone argue that the final twist was needed or welcome. It was a sense of curiosity that compelled us to gather in The Middle Room and view the film once more. None of us had seen it since it was originally released: indeed, we have heard of few people who felt the need to seek this out on DVD. Perhaps that is why we were able to find the 2-disk special edition marked down to five dollars. And yet, not all our memories were negative. We have fond associations with aspects of the picture, and we wanted to see how it held up. We should add that to discuss further is delve into details about the film and its story. Those who've yet to see this picture may wish to recluse themselves from further discussion. To put it crudely, there may be spoilers below. You are thus warned. It should come as little surprise that the years have had little effect on the film. There were a few moments, though, when we found ourselves thinking of Wall-E, which may have been inspired in some ways by the picture. As anyone familiar with The Middle Room is no doubt already aware, this is high praise indeed. What we find fascinating about Artificial Intelligence: AI (henceforth to be referred to as AI:AI for short) is that there is a great science fiction film contained within it, though the movie itself is mediocre at best. While this claim may seem appropriate to many films, its application is far more literal here than any other situation we can think of. One could, we believe, edit AI: AI into a fantastic science fiction film lasting about an hour and a half. Further, this could be done using only the footage contained in the final product. The scenes themselves were beautifully imagined and shot, and the acting was good overall. There were some script problems, but nothing that couldn't have been fixed in the editing room. As AI: AI now stands, it is a very dull movie with interesting moments. The ideas are intriguing; the execution tedious. It is, as we've said before, a good movie encased in a bad one. The movie itself is a dilemma, challenging these simple dichotomies with a complexity of quality far more fascinating than its own simplistic philosophical musings. Indeed, we posit that by virtue of existence it poses a greater challenge to the realist than a square circle ever could: AI: AI is truly contradiction incarnate. Even with its problems, there is much to impress, much to enjoy. Visually, the movie is beautiful. Gigolo Joe and Teddy are fascinating characters, brilliant twists on the idea of servant robots. When David's quest evolves into a fairy tale the film begins to resonate, and it continues to do so until it randomly jumps ahead two thousand years. Had they kept the first ending, with David beneath the sea praying to a statue for all eternity, the movie would have been truly poignant. As it is, the tension is shattered with as little care as the finale of The Village: what was intended as art comes off as bad comedy. But unlike in The Village, this is an error that can be amended with a remote control. This is the true tragedy of the movie: the hard work was done. The movie was, for all intents and purposes, complete. Only in post-production was it effectively destroyed. That the same man created the picture as destroyed it is a great irony. But, for all its flaws, there is enough in this film to justify five dollars. AI: AI has a great deal of replay value on DVD. Thanks to the fast forward button, this movie, we expect, will get better each time we watch it. When we think back on Kay Bee, it is best to remember it in its prime; a store filled to the brim with toys, its shelves all but untouched. Of course, we suspect that is what has led us to the current situation. Still, we hope to remember Kay Bee as the pristine establishment it once was, not the wasteland we encountered last week. But at least we got some great deals. 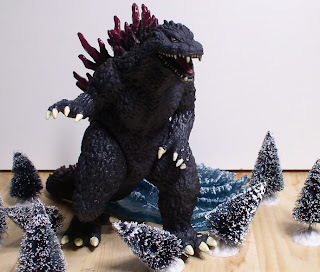 Which brings us to The Clearance Bin, where you will find a review of a Godzilla figure, purchased at a discounted price in a store that seemed to have faced the wrath of a giant monster itself. Even in tragedy, dear reader, there are bargains.